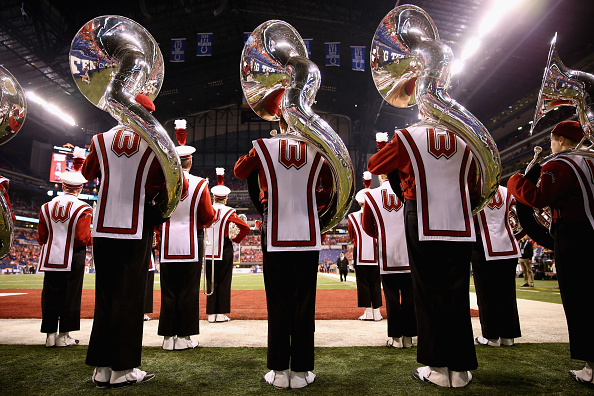 According to students and parents of the Wisconsin Badger Band, about 60 members of the band showed symptoms of sickness over the B1G Championship game weekend with many needing to be treated with IVs at the game. Students told us that they believe it was some type of food poisoning. About 9 students were unable to perform at all during the game, while many more dropped out of the game as it went on. Twelve were taken to the hospital. One member told us that some students refused to sit out halftime even though they weren't feeling well because they didn't want to leave a hole on the field and miss the opportunity to march in the B1G Championship Game. NOW THAT IS DEDICATION! The band and Marion County (Indiana) Health Department are investigating to see where the illness could have come from. For some of the band members the timing couldn't have been worse. Not only were they now out of the biggest game of the year, they also had finals this week. The students who were sick took a different bus back to Madison that night in an attempt to quarantine the members.